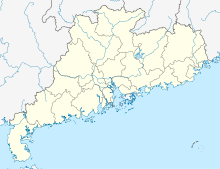 Zhanjiang Airport (Chinese: 湛江机场) is an airport in Zhanjiang, Guangdong, China (IATA: ZHA, ICAO: ZGZJ). It also called Zhanjiang Xiting International Airport (Chinese: 湛江西厅国际机场）、 Zhanjiang Potou International Airport (Chinese: 湛江坡头国际机场）、 Zhanjiang Xiashan International Airport (Chinese: 湛江霞山国际机场）. It was founded in 1952.